I’ve never been overly good at critical reflection (without the stories, feelings and “he said/she said” going on in the background) but having to just stop and look back at the last three weeks has been harder than I thought. Hard because I had to make a choice on what I felt has been the best happiness tips that have worked for me. Choosing for me adopts the mindset of getting it right and losing something. 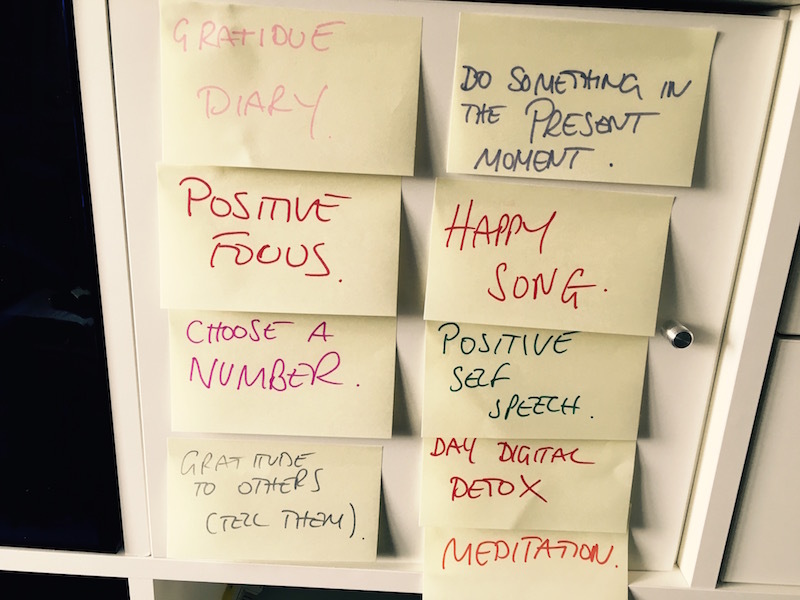 So I consulted my Happyness Board at home for inspiration (yes get me, I have a Happyness board #justsayin’) and I saw “Positive Speech” and thought I’d change the meaning I associated with choosing to: doing something and gaining something. So in that spirit, I re-arranged the daily tips and made my board for today. I’ve also given myself permission to change it daily, moment to moment if needed and just knowing that all these ideas are here means I never have to lose anything, just gain and just choose. For 3 weeks I’ve been consciously choosing happiness and hadn’t really thought of it at that way. I’ve felt it, thought it, I’ve danced round the room to the Happy Songs, I’ve gone for the awe walk, I’ve meditated on it and I’ve turned my phone off and not thought about it. (Well, maybe I thought about it a bit). I’ve experienced it in different ways, not just through the mind. And it’s been great. The diary will be full tonight with gratitude for having experienced these 3 weeks and and in anticipation for what the next 3 weeks will bring and the next 3 after that. I can honestly say I’ve gained something special and I’ve done something special. I made a choice. Happy days.